Lawns face many foes. Between drought damage, insect and disease issues, and the pressure of invading weeds, your beautiful lawn can become ugly in just a matter of a couple months. Unfortunately, it’s fairly common to have thin or bare areas appear in your lawn regardless of how immaculate it was earlier in the year. As fall approaches, and areas of dead grass don’t recover and green back up, many homeowners begin to inquire about lawn seeding services in Allentown, Bethlehem, and Easton, PA. There are many benefits to seeding lawns not only as a curative measure to lawn damage but also in order to keep your lawn looking its best. Good Soil-to-Seed Contact: Throwing grass seed on top of hard, compacted soil isn’t ideal for germination. Grass seed gets its best start in loosened soil where it can quickly establish a root system. For this reason, we perform lawn aeration services immediately before overseeding a lawn. The resulting small holes and plugs on top of the soil provide a great environment for you to get the most out of lawn seeding services. Ample, Consistent Moisture: An essential element required to get grass seeds to germinate is moisture. Watering lawns on a consistent and methodical basis after lawn seeding services is the most important thing you can do to get the most bang for your buck. Nutrient-Rich Soil: Young grass seedlings need nutrients to mature into mature grass plants over the following 9-12 months. 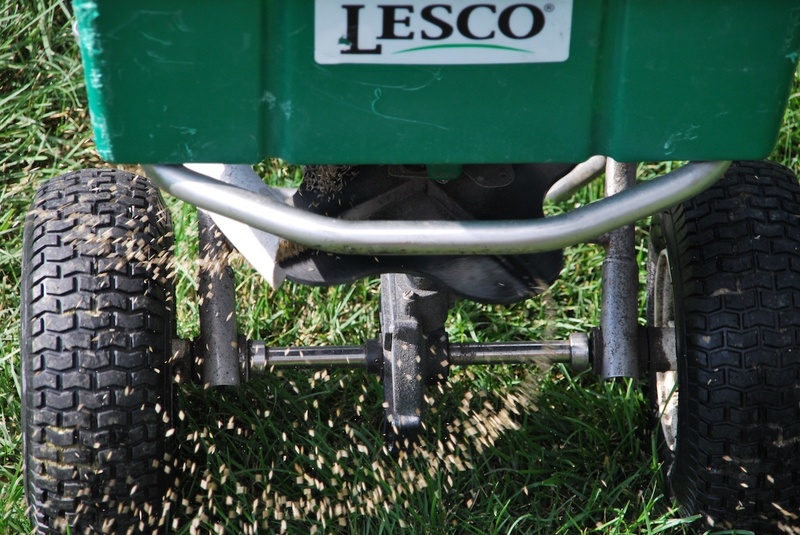 Fertilizing lawns with Phosphorus immediately after lawn seeding services will help seedlings to get the jumpstart they need to survive, but an ongoing lawn care program will also provide the nutrition they need to thrive. While it’s possible to attempt seeding your lawn yourself, the whole process can be overwhelming, complicated and offer no guaranteed results. For this reason, many Lehigh Valley residents use lawn seeding services to rejuvenate their lawns each fall. 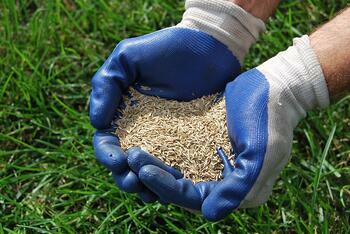 Joshua Tree offers the best grass seed professionally applied after a core aeration service. This service can be performed as a standalone service or included as one of the beneficial lawn maintenance tasks in one of our lawn care programs. We invite you to contact us for a free consultation for lawn seeding services. We welcome the opportunity to evaluate your lawn, explain how seeding will improve it, and help you get the lawn of your dreams.